Discover what NFC is, and how to use it. How does NFC technology work? NFC, or Near Field Communication, is a short range wireless RFID communication technology. It means that two devices equipped with NFC technology are able to communicate with each other and share information as soon as they are close to one another. There is no need to launch an application, bringing the devices near each other automatically triggers the defined action - from a single easy "tap"! The NFC technology is derived from RFID (Radio Frequency IDentification) and works by creating a "near field" (maximum approximately 10 centimeters) using high frequencies that will allow to interact with NFC equipped devices. The technology began to be used in France in 2011, but it is just starting to thrive outside the mobile payment usage. Thus, smartphones are more and more equipped with NFC, and initiatives are multiplying to test and improve its use. 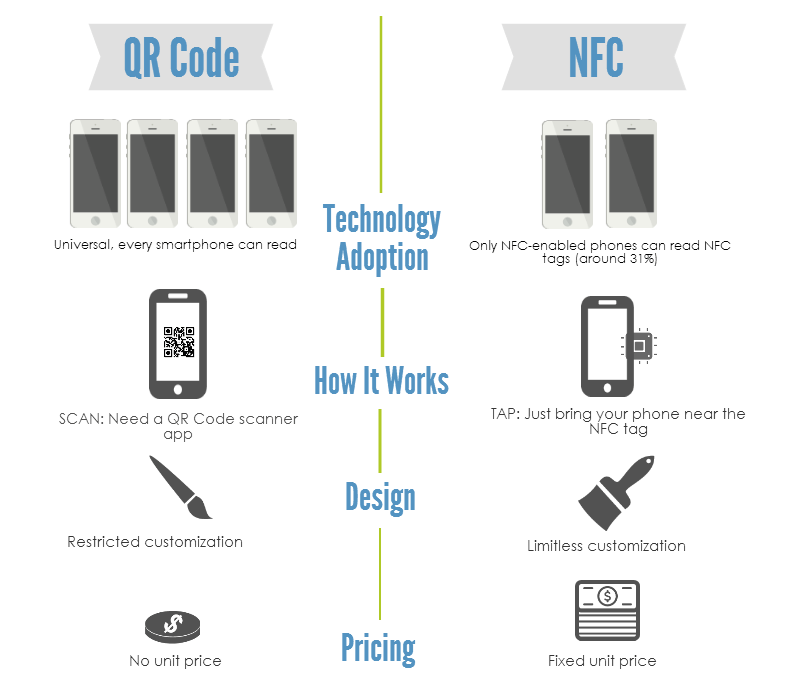 If you’re still asking "NFC technology... what is it exactly?" We would advise you to watch this presentation video about NFC which is far more concrete. This is the "passive" mode, by which a mobile terminal behaves like a smart contactless chip. The phone sends the information to the NFC (Near Field Communication) device, e.g. to a ticket validation kiosk or a payment terminal. It can serve various purposes: mobile payment, show or transportation tickets, coupons, access control, etc. In this case, the mobile has an "active" role as a contactless chip reader. This mode allows you to read information or trigger actions by simply "tapping" or "bumping" your phone close to a NFC tag. On posters, billboards, monuments, bus stops or product packagings, NFC tags can be placed anywhere on all your communication channels, which widens the range of use and opportunities. The focus here is to provide a seamless user experience across channels with a specific digital content, from offline to mobile. In this aspect, NFC tags are very similar to QR code capabilities and can be used as the cornerstone of your Offline To Online marketing campaign. In this mode, the data exchange works in both directions between two mobile devices communicating with each other via NFC. Common applications are to exchange contact information (vCard) between two smartphones, to transfer files such as photos or videos and instantly execute money transfers as well. NFC (Near Field Communication) and QR Codes are two wireless technologies that can be used the same way: transfer data and link content. There are some characteristics that differentiate one another though, in terms of marketing purpose. QR Codes are universal: every smartphone can potentially read a QR code, as soon as a QR Code reader app has been installed (app download just takes 3 clicks and is free). When it comes to NFC, only 50% of smartphones should reach NFC compatibility in 2015 in the world (see the detailed list of NFC compatible smartphones here). To tap or to scan? To read a QR code, users first have to open the specific QR Code reader application downloaded from the app store, and point their smartphone onto the 2D code to decode it. NFC is more convenient and faster: the action is automatically triggered when your phone comes within 10 cm (3.94 inches) near the NFC tag and you get instant access to the content on mobile- without a single click. Today, the design of your QR Codes can be customized with your brand's colors or integrate your logo. You have lots of advanced personalization options. Still, you have to follow some design rules so that your code remains scannable. For NFC tags, there isn't any design restriction as the information is not encoded in the tag design itself. Thus, tag can be fully personnalized or they can even be completely hidden in your own support without affecting the capabilities. QR Codes do not have a unit price, they are scalable: you produce them once and you can use or print them everywhere and as many times as you need without additional cost. NFC chips are a physical product, costs mostly depend on how many NFC tags you need. While NFC technology (Near Field Communication) is now available in many smartphones such as Android ones, being gradually used by a wider audience, iPhone devices still aren't compatible (unless for payment with Apple Pay). Apple unveiled its own technology, the iBeacon, available from the 5 and 5S iPhone versions as well as in recent smartphones launched since. For both technologies, the main function is the same: to give instant access to digital content and automatically exchange data, remotely and wireless. 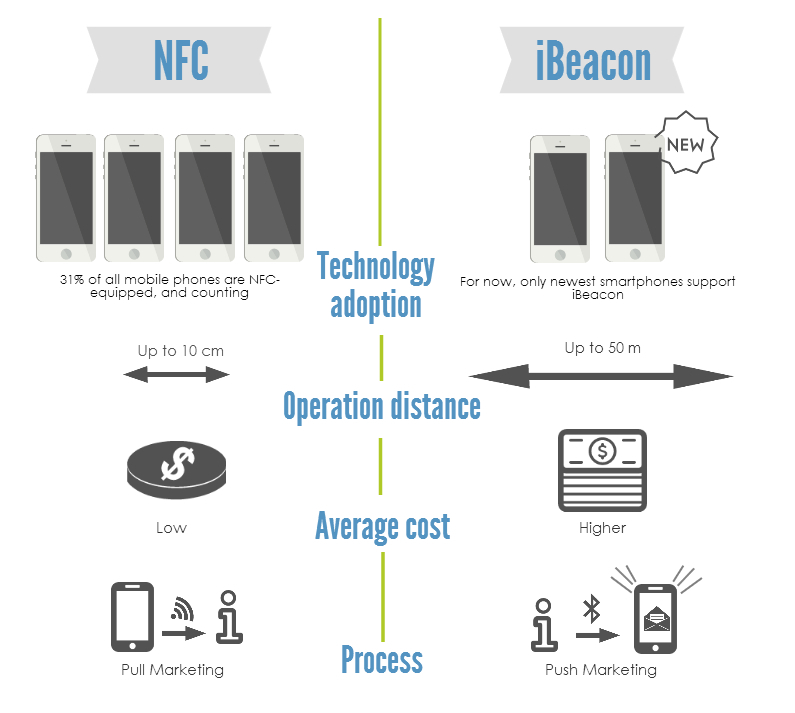 However the main difference between NFC and iBeacon is the way it is used for marketing purposes : while NFC is a "pull" marketing technology, iBeacons is a "push" one. Thus, on the one hand the user will have to take the first step to access the information, whereas on the other hand it will be noticed via a notification without asking for it. Radio Identification, or RFID (stands for Radio Frequency Identification) is a technology allowing to identify and characterise an object thanks to a sticker broadcasting radio waves. RFID is part of Real Time Localisation Systems (RTLS) and is widely used for logistical purposes in many different sectors where tracking merchandises is a key issue: retailing, health, transport and logistics, military activities, etc. Thus, NFC is derived from RFID but is different in many ways. One of the main differences is the fact that NFC allows a limited data sharing between the tag and the reader. Then, another one is that NFC has a really short range compared to RFID (a few centimeters versus a few meters). Want to try out the NFC technology?